Their Short and Oh So Sweet Course. 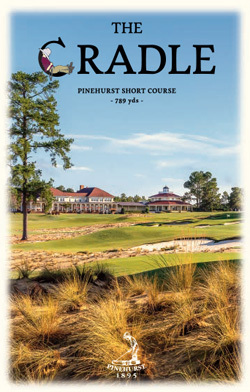 The most recent addition to the Pinehurst Resorts collection of courses is The Cradle. 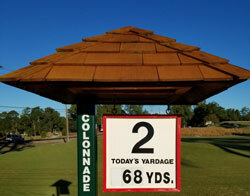 The newly minted nine hole short course is the brainchild of course architect Gil Hanse and Pinehurst owner Bob Dedman. The Cradle is located on a ten acre parcel of land steps from the clubhouse on the spot where the first shots were struck back in 1898 on Dr. Leroy Culver’s original nine hole routing. The Pinehurst Golf Links, as they were known back then, had names for the original holes and several of the names from the Culver layout have made they way to the signposts that mark each teeing area of The Cradle today. Prior to completing his masterful renovation of Pinehurst #4 Hanse fashioned this 789 yard par 27 routing that pays homage to Culver, Donald Ross and the beginnings of golf at Pinehurst. 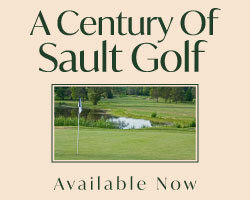 Featuring holes that range from 56 to 127 yards the longest club you are likely to use is your pitching wedge. However, don’t let the short yardage fool you into thinking this is an easy test of golf; it’s not! The green complexes are extremely tricky, even boarding on devilish, designed in a manner that would make Ross himself proud. In keeping the flavour of #2 and Hanse’s recent remake of #4 the routing incorporates natural landscapes and wiregrass that would have existed 120 years ago on the original Pinehurst grounds. The holes flow through the rolling terrain, and on most, you will either pitch down to a green site set below the teeing ground or be faced with a shot to an elevated putting surface. The green complexes are surprising large for such a short course but are undulating with tiers, swales, false fronts and drop offs making it difficult to pin seek. The key to scoring on the Cradle is to err towards the center of the green and putt to the edges. Shots that miss the target will find their ball running down into a collection area or bounding into a rough-hewn bunker that protects the dance floor, leaving a tricky up and down for par. 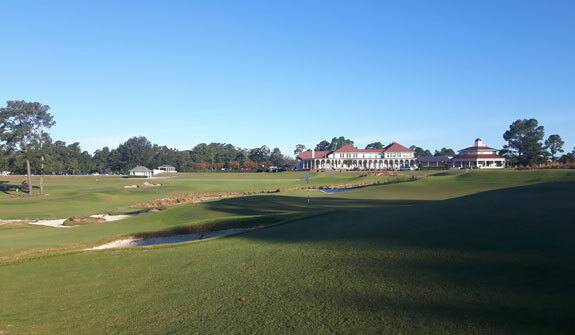 Pinehurst has created an easy going atmosphere at The Cradle where fun is the name of the game, the course is easily walked and the rounds are quick. Whether you are banging it around with your pals over a few pints or playing with the kids (U18 play for free) The Cradle is a really fun nine holes of golf. Chances are that as soon as you are finished your Cradle experience will want to go back to the first tee and try again.